Pass Trainer can train your hands to be stronger. A normal deck will fell like a sponge after training. It makes doing the pass or other card sleights easier. 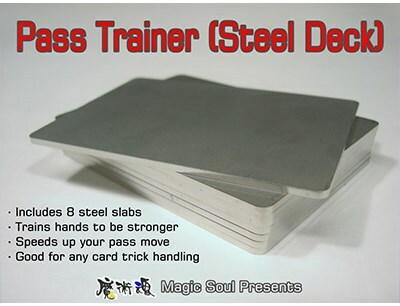 Training: Practice the pass or another card sleight of hand you like with the steel deck. Be careful not to hurt yourself or other people. Every time you train, just keep practicing for 15 to 30 minutes and then rest, not too long. Take a normal deck and it will feel like a 'sponge' deck, so light and so manageable! Other Thoughts: It doesn't only train your hands but also can be used for magic routines such as Ambitious Card.